While writing this blogpost, I started thinking back on the past couple of weeks. Only now that the dust has settled, and I have been able to put my mind to rest for a couple of days, has everything we saw, did and learned started to really sink in. For many of us this trip has been a special trip to say the least. It is annoyingly difficult to explain to people what exactly has been so ‘eye opening’ about this trip, and what exactly the shocking, or special things we saw were. Yet, in these blogposts we will try to explain, and try to make people understand. 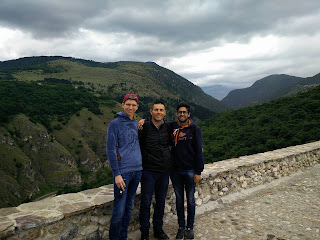 For me, personally, Kosovo has an incredible learning experience, yet I still have trouble pinpointing exactly what I leaned. From day one onwards you notice Kosovo is not like any other country. All of us knew we were not there for holidays, yet that became more clear to me after our very first interview. Two other friends and I interviewed a student at the University of Prishtina, and she opened up to us completely. She told us about her grievances from the war, and about future hopes. Once people start opening up to you, you begin to see their side of the problem. Every time you would hear another perspective on the war, or other issues. When you talk to so many different people about the same topic, in our case Kosovo and the European Union, you start to notice the small things. Some things people say might seem insignificant at first, but once you look at the whole story, and once you see the whole ‘picture’, then these motivations or thoughts end up being key. Many people had good hopes for the future of Kosovo and the EU, and every single one of the people we talked to had different, yet similar reasons. They all wanted a better future, both for them and for the next generation. Talking about the future, I believe Kosovo has a bright one coming. I hope Kosovo will be able to get over its internal problems soon, and will be able to focus on other prevailing issues such as joining the EU, promoting certain rights and much more. Since I have been so involved with Kosovo and the EU, it has been on my mind a lot. For Kosovo to join the EU there are two conditions, they need to tackle corruption, and there needs to be a demarcation of the border with Montenegro. The issue of corruption is very controversial in my opinion. The EU mission in Kosovo is supposed to help clear corruption, in which they are not succeeding, yet they still demand of Kosovo to tackle corruption before being able to enter. If the EULEX mission would be more effective, Kosovo might not have this problem, and might already be in the EU. I have caught myself being Pro-Kosovo in many regards, and rightfully so. For example, I think the EU is at fault and not Kosovo, I think Kosovo should be recognized by both the UN and the EU and I think Kosovo deserves a chance in the world, which they are not getting right now. Because of this trip I have realized how amazing this country is, and what it has to offer. I have also seen what kind of particular situation they are in, and that it is will be difficult to get over the past grievances and build now connections. Yet, luckily there are many organizations who work hard to bring Kosovo back on track, and connect the people again. On a more personal note, I have learned to trust. As Anne would say, “Trust the process”, and she was right. The process, which starts day one of Peace lab, and unfortunately ends as I am writing this blogpost, has been amazing. Day one made me realize this place (Kosovo) was special, but the whole month in total has made me realize the whole process is special. Throughout the 10 days in Kosovo, we had a busy schedule, and often did not have time to process what we saw, or did. This realization has only hit me after the last class finished last Friday. It was that evening that I realized what an amazing month I had just had. To name only some of the things I thought about: We met amazing people, of which the highlight was Enver, our host and friend, we saw firsthand how the peace building process works, we saw how people opened up and told us their hopes and dreams about the future, and most importantly, I hope with our documentary (Online soon) we can inform more people about Kosovo and in that way, help Kosovo in any way possible. Kosovo has left its mark on me and on how I see certain issues. I am sure I have not completely processed everything yet, but that needs time, and that’s exactly what I have right now, two months of time.